Its target is predominantly the venous system. It is rare but commoner in the populations emanating from the Middle East, Far East and the Mediterranean. Brain involvement is seen in about a third with stroke and headache. There may be brainstem involvement. Cerebral venous sinus thrombosis may occur. Venous thromboembolism may be seen. There are typical skin lesions (erythema nodosum) or a positive pathergy test result. However the diagnosis is entirely clinical as there is no definitive test. Focal or Multifocal CNS lesions: Seen in 5–20% of cases. Focal inflammatory lesions with corresponding neurology develops which can mimic stroke. This is the typical parenchymal type. The most common site is the brainstem. Diplopia, ataxia, dysphagia,pseudobulbar speech . Weakness and sensory symptoms. Spinal cord may be affected. Optic nerves can be affected. Meningoencephalitis: headache and drowsiness, which worsen over several days. Cerebral Venous thrombosis: Headache, ischaemic stroke with haemorrhage may be seen. The Pathergy test involves using a sterile needle to cause a small skin lesion which develops as a sign of skin hyperreactivity within 48 hours. False positive tests can be seen in pyoderma gangrenosum, Sweet syndrome, inflammatory bowel diseases, familial Mediterranean fever, acute myeloid leukaemia, and interferon alpha treatment. MRI: changes typically may be seen in brainstem–thalamic–basal ganglia lesions. 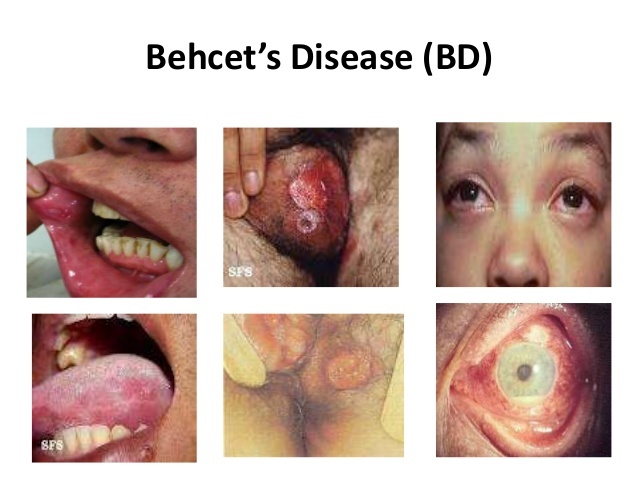 These can support the diagnosis of acute/subacute parenchymal disease. There may be focal or multifocal lesions. There may be signs of a meningoencephalitis. Lesions may show vasogenic oedema on T2. Cerebral vein thrombosis may be seen. Eye involvement needs urgent ophthalmologist review and is treated with steroid eye drops, injections, azathioprine, or biologic drugs such as infliximab or interferon. Referral to a neurologist experienced in management of the CNS manifestations of the disease is recommended. In those with CNS involvement high dose IV Methylprednisolone and immunosuppressives may be used. Long term azathioprine, methotrexate or mycophenolate. In aggressive disease cyclophosphamide and methotrexate and interferon-alpha, or azathioprine may be considered. Biological agents may also be considered such as infliximab or etanercept.